While driving to town early one November morning, this scene at Big Lake, Manitoulin Island, called out to me and I had to stop the car to take a photograph. Much of the scene has my interpretation of colour, and the loons had already left for the south for winter. Michael Wilcox's wonderful colours and colour system and Daniel Smith's autumn and quinacridone colours were my choices here, and good ones, wouldn't you agree? 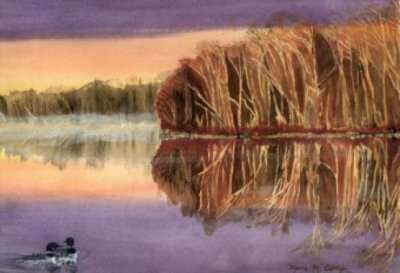 "Sunset on Big Lake, Manitoulin Island", Watercolour, Framed (20" X 29"). The original is no longer available, but prints and cards can still be ordered. If you are interested, you may reach me through my Guest Book.